Mental Health First Aid is a public education program that introduces participants to risk factors and warning signs of mental health problems, builds understanding of their impact and overviews appropriate supports. This 8-hour course uses role-playing and simulations to demonstrate how to offer initial help in a mental health crisis and connect people to the appropriate professionals, peer, social and self-help care. The program also teaches common risk factors and warning signs of specific illnesses like anxiety, depression, substance use, bipolar disorder, eating disorders and schizophrenia. Like CPR, Mental Health First Aid prepares participants to interact with a person in crisis and connect the person with help. First Aiders do not diagnose or provide any counseling or therapy. Instead, the program offers concrete tools and answers key questions like, "What do I do?" and "Where can someone find help?" Certified Mental Health First Aid instructors provide a list of community healthcare providers and national resources, support groups and online tools for mental health and addictions treatment and support. All trainees receive a program manual to complement the course material. Common signs and symptoms of mental illness. How to interact with a person in crisis. How to connect the person with help. Why Mental Health First Aid for Public Safety? Mental Health First Aid for Public Safety teaches you how to identify, understand and respond to signs of mental illnesses and substances use disorders. This 8-hour training gives you the skills you need to reach out and provide initial support to someone who may be developing a mental health or substance use problem and help connect them to the appropriate care. It focuses on the unique experiences and needs of public safety personnel and is a valuable resource that can make a difference in their lives, their coworkers' and families' lives, and the communities they serve. Combating stigma of mental illness. Enabling early intervention through recognition of signs and symptoms. Why Youth Mental Health First Aid? Youth Mental Health First Aid teaches you how to identify, understand and respond to signs of mental illnesses and substances use disorders. This 8-hour training gives adults who work with youth the skills they need to reach out and provide initial support to adolescents (ages 12-18) who may be developing a mental health or substance use problem and help connect them to the appropriate care. Sponsoring a Mental Health First Aid training for your business, organization, club or group is an easy and cost-effective way to support your community! Training and materials are FREE for those who live or work in St. Clair County. Trainers and equipment are mobile and can conduct sessions at your location of choice. Both the Youth and Adult curriculum are 8 hour trainings that can be offered as a full day, two half-days, or several shorter times. Trainings can be for your select group, or open to the general public. Daytime, evening or weekend classes can offered. Class size for trainings are a minimum of 15 and maximum 30 people. St. Clair County Community Mental Health (SCCCMH) will provide marketing materials to help you advertise your training. SCCCMH will handle participant registration. If attendees need professional Continuing Education credits, SCCCMH may be able to assist. 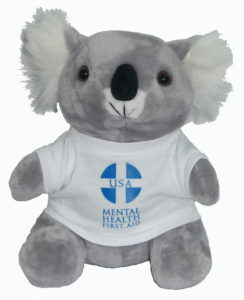 For Mental Health First Aid training dates please visit our calendar.